The writing world calls her Epstein LaRue, but reality calls her "Kay." No matter what you know her by, she is a lady of many talents. She has been a nurse since 1992, and has worked on medical, surgical, emergency, telemetry, rehabilitation, and psychiatric units. In January 2001, Epstein’s first book, “Love At First Type: An Online Romance Based On A True Story,” was published. This fictional novel is about how she and her husband met online. This book was requested in 2005 by an independent filmmaker for possible production. In January 2003 her second book, “Crazy Thoughts Of Passion” was compiled as an attempt to put together her medical knowledge and romance writing. It is a traditional romance about a nurse who falls in love with a patient’s son. In January 2005 her third and most successful book, “Highway Hypodermics: Your Road Map To Travel Nursing” was published. Although only on the road for two years, everything that she learned in those two years was put into the book. In September of 2005, this book was recognized by USA Book News as one of the top finalist for professional book of the year. In January 2007 (...notice a pattern yet? ), “Highway Hypodermics: Travel Nursing 2007” was released by Star Publish. The chapters of the first edition have been rewritten and a lot more information has been added. The previous 143-page non-fictional work grew to over 290 pages. Recently, this novel was also recognized by the USA Book News as one of the top finalist for professional book of the year and medical reference of the year. Twice this year, it has gained the ranked number one in the Nursing Trend, Issues, and Roles category on Amazon. Although a little out of "January odd year" tradition, Epstein is pleased to bring you in January 2008, "Crazy Thoughts Of An Online Romance." A collectors edition of both nursing romance novels along with a non-fictional section on how you can you have successful online relationship. 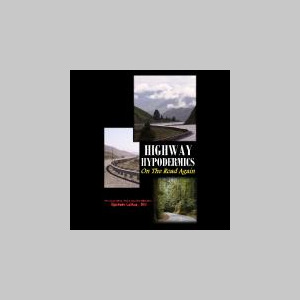 In January 2--0, she published the third book in the Highway Hypodermics series, "Highway Hypodermics: On The Road Again." Other recent accomplishments include having her article, “Top 10 Reasons To Love Travel Nursing” published in one of nursing's most prestigious magazines, Nursing2004. She was also named as a Traveler of the Year by Healthcare Traveler magazine in December 2005. In May 2007, her website is featured on Dr. Phil.com, and in August 2007 she was published in the Electorophysical Lab Digest. Travel nursing is a dream that has become a reality. She continues to travel the United States with her husband, while her son has successfully flew the nest and lives in the State of Washington. LaRue keeps herself busy during the month by publishing a monthly eZine on travel nursing, constantly updating her travel nursing website, and visiting travel nurse companies with program on retaining nurses. Her travel nursing informational website is her way of keeping traveling nurses updated about travel nursing happenings between the two years of publishing the book series. Her plans for the future are to not only continue the Highway Hypodermics tradition, but to add books on internet marketing, successful publishing, and how to retain nurses.